Home / Uncategories / Indian Government Orders 32 Web Sites Blocked, Including GitHub, Archive.Org, ipage, DailyMotion And Vimeo!!! 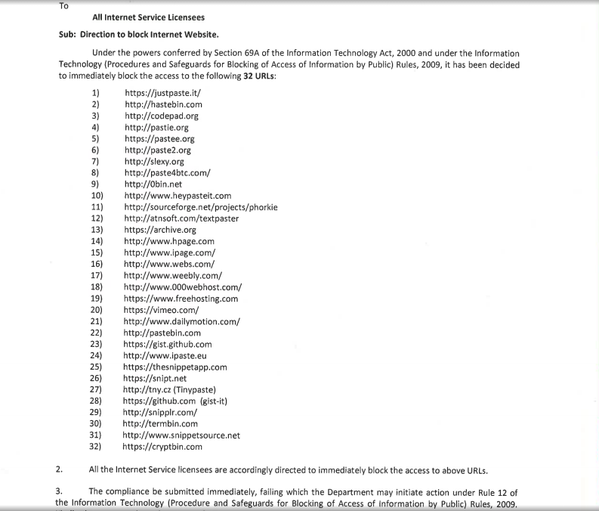 Indian Government Orders 32 Web Sites Blocked, Including GitHub, Archive.Org, ipage, DailyMotion And Vimeo!!! It now appears that the blocks are being carried out on the instructions of [India's] DoT (Department of Telecom). The telecom body reportedly issued a notification regarding the same on December 17. A screenshot of the circular has been posted on Twitter by Pranesh Prakash. The notification mentions that 32 URLs including Pastebin, video sharing sites Vimeo and DailyMotion, Internet archive site archive.org and Github.com( a web-based software code repository), have been blocked under Section 69A of the Information Technology Act, 2000. DoT has also asked ISPs to submit compliance reports. However, we have not been able to verify the authenticity of the circular. It's not clear why these sites have been blocked in this way, but Prakash, who is Policy Director at the Centre for Internet and Society in Bangalore, India, believes it may be because of a court order in a copyright case. He also points out that this is not the first time this has happened. However, the key nature of many of the sites affected, and the fact that entire sites, rather than just some of their pages, were blocked, is bound to lead to calls for this blunt instrument to be refined before it is used again. The websites were blocked for hosting content that is pro terrorist group ISIS and not cooperating with government investigations, officials said. Arvind Gupta, the head of IT Cell, BJP Tweeted: "The websites that have been blocked were based on an advisory by Anti Terrorism Squad, and were carrying Anti India content from ISIS. The sites that have removed objectionable content and/or cooperated with the on going investigations, are being unblocked." Even so, taking down entire Web sites -- especially major ones like GitHub and archive.org -- is clearly a completely disproportionate response, and shows the dangers of using this very crude approach.